Matt Smith graduated from Kell High School in 2008 where he was a four year varsity letterman as a pitcher. He was named to the Cobb County All Region Team in 2007 and 2008 as well as Cobb County Pitcher of the Year Runner-Up in 2008. Matt played his summer baseball while in High School for the East Cobb Astros and East Cobb Braves where he won a NABF National Championship and the 17U BCS National Championship in 2007. After High School Matt attended and played baseball at the University of North Georgia from 2009-2013. He was a four year pitcher for Coach Tom Cantrell and the Saints. He graduated from UNG in 2013 with a Bachelor in Science degree. Matt has been coaching since he finished playing ball in 2012 with East Cobb and Nelson Baseball School. 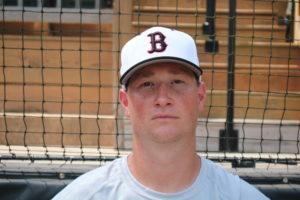 He has primarily coached the 11U, 14U, 15U and 16U age groups in the past four years. Matt joins the Bombers family this year coaching the 15U Bombers (Smith) team for the 2016-2017 season.